This is our 18 Foot Wild Rapids Double Lane Water Slide. It is a two lane curved water slide! After riders climb to the top of the slide using the easy climb ladder, they are able to sit next to each other and race to the splash pool below. Experience the thrill of riding down this wild and wet wave of fun. The footprint is 25'L x 16'W x 18'H, this slide will fit in almost any front or backyard but it is still big enough impress riders at your larger events. 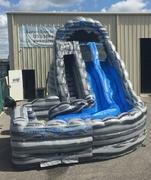 This water slide is an excellent rental choice for all ages and any type of party!